Sunday 28 July. Just me and 6 lady companions for today’s 6¼ mile walk along Holkham beach. A clash of dates with Holkham Country Fair meant that it was busy around Holkham Hall but we soon lost the crowds when we headed out along the beach. Sue was suffering from pain in her leg long before we reached the turning point at halfway and her pace began to slow. With more than a mile to go back to the cars she really was suffering. Beryl decided that she would dash ahead to bring her car down Lady Anne Drive to meet us and shorten the walk for Sue. Five minutes later a large pick-up vehicle belonging to the Holkham Estate approached us driving down the rough track. Beryl was the passenger. She must have seen the pick-up and begged a lift for Sue. It was really kind of the driver and I’m sure that Sue greatly appreciated it. Other than this, it was an uneventful walk in super weather conditions; warm with a nice breeze. This entry was posted in Uncategorized on 28/07/2013 by fenlandramblers. Well, 2 weeks ago I was on the verge of cancelling my walking holiday in and around Coniston as my left foot was far too painful. However, I took the opportunity of visiting the Rebound Clinic in Settle on the 2nd day of my holiday where Andrew Stanley made me a pair of temporary orthotics. These did the job by realigning the way in which I place my foot on the ground whilst also relieving pressure on my metatarsal heads. They produced an 80% improvement in my condition and whilst I’m still experiencing some discomfort, I managed to walk over 50 miles including a couple of strenuous 6 mile hill climbs. I’m going back to see Andrew in 6 weeks time when he’ll make me some more permanent orthotics which I hope will reduce the foot pain even more. I visited a consultant at the Fitzwilliam Hospital in Peterborough today where I expected to have an MRI scan. Instead, I had more x-rays and the consultant made a thorough physical examination of my foot. His thoughts were to continue along the orthotics route and to see him again in 3 months. If there hasn’t been any improvement by then, he will consider an ultrasound scan, injections and/or alternative NHS funded orthotics. So, I guess that it is just a waiting game but I’m still off for my month’s holiday in Northumberland & Hawes. This entry was posted in Uncategorized on 22/07/2013 by fenlandramblers. Saturday 20 July. My final walk of this holiday was 5¼ miles with over 1,500ft of ascent across the Yewdale Fells. Starting at 07:30 from Coniston, I walked past the youth hostel and then the climbing really began. A very steep uphill which included a 1in3 scree slope. Once on the top there were great views back towards Coniston and across to the Old Man. The descent to the road leading towards Tliberthwaite was fairly gentle and I then followed the Cumbria Way back to the car. This entry was posted in Uncategorized on 20/07/2013 by fenlandramblers. Friday 19 July. 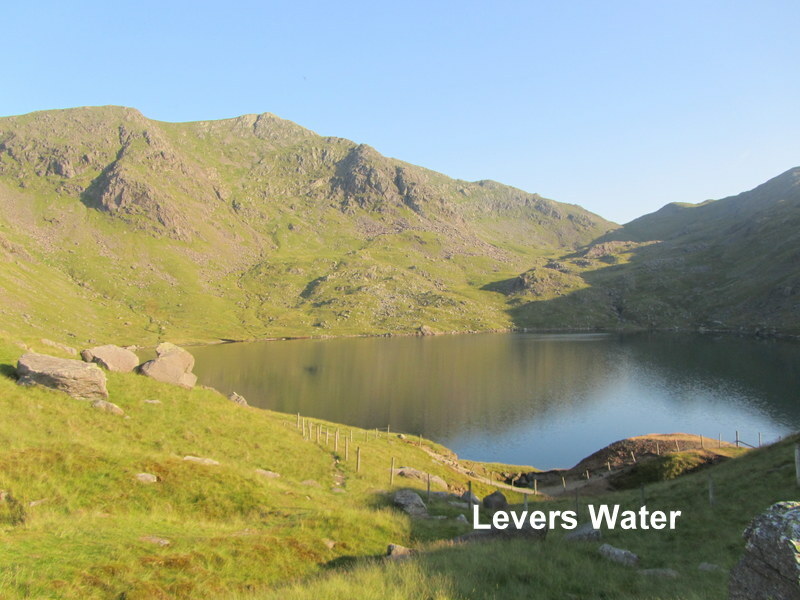 To beat the heat, I set off from Coniston at just before 6am this morning to make my way to Levers Water. Climbing up through the Coppermines Valley, I passed the YHA before arriving at Levers Water where there were a couple of “wild campers” on the far side of the reservoir. It was getting really hot by 8am when I met a few groups of DofE youngsters making their way up to the Old Man. They were really going to suffer today. I made my way back down through Boulder Valley and Crowberry Haws before rejoining my outward path at the Miners Bridge. The route was 5.4 miles with just over 1,600ft of ascent. I was back in Coniston at 08:40 and had to wait until 9am for the café to open when I could have a well deserved breakfast of a pot of tea and bacon butty. It was 16c when I started my walk and 25c by the time that I’d finished. This entry was posted in Uncategorized on 19/07/2013 by fenlandramblers. Thursday 18 July. It really is getting too hot for walking so today I restricted myself to an early morning walk around Coniston village. Just a couple of miles with a few picture opportunities. The rest of the day is given over to watching the second Ashes test match and the TDF on TV. I might motivate myself for a very early start tomorrow to beat the heat of the day. This entry was posted in Uncategorized on 18/07/2013 by fenlandramblers. Wednesday 17 July. Just a short early morning walk today. 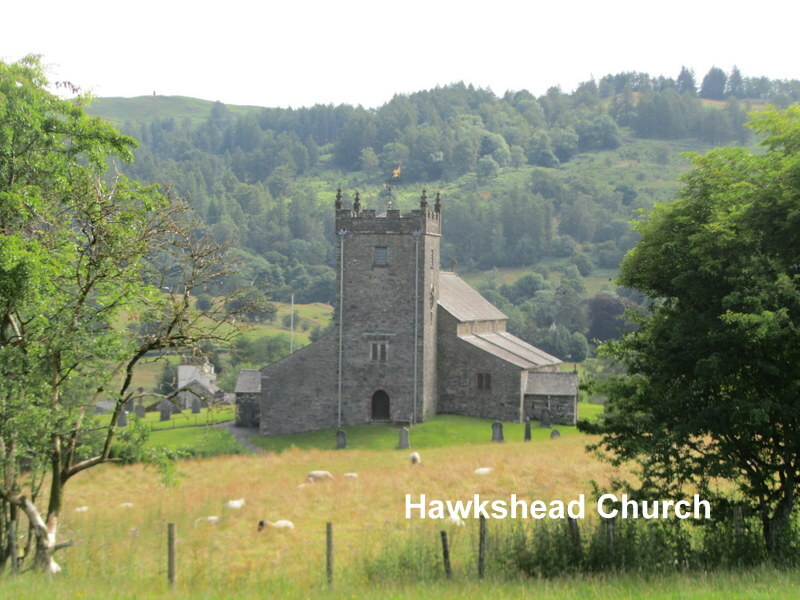 4 miles with 800ft of ascent from the village of Hawkshead. This entry was posted in Uncategorized on 17/07/2013 by fenlandramblers. Tuesday 16 July. I fancied an easier walk today so I decided to revisit a route that I did a few years ago with Bea & Amanda. I delayed my start from Elterwater until 08:45 so that I didn’t arrive too early at the Skelwith Bridge café. This was my one and only stop for a welcome bacon butty and a mug of tea. Refreshed & refuelled I then made my way to Colwith Force which, although in full flow, was somewhat obscured by the summer foliage. A few more sunny & leisurely miles saw me passing through the Elterwater quarry before walking alongside Great Langdale Beck on the way back to the car. The walk was 6.5 miles with just over 1,000ft of ascent. This entry was posted in Uncategorized on 16/07/2013 by fenlandramblers.